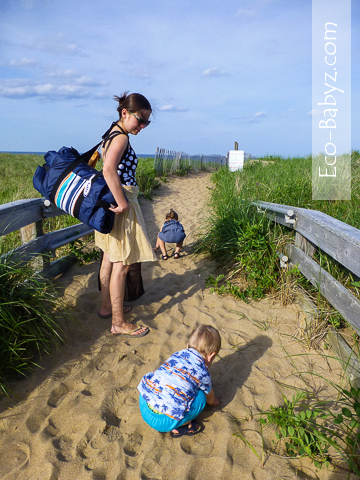 On Thursday last week the scorching heat gave us little choice but to make our first trip to the beach. So we went and took lots of photos! Above, as we arrived Baby T was mesmerized by the sheer amount of sand, digging his pudgy little hands into it. Last summer he was just six months old, of course he remembers nothing of the beach! It was incredible seeing everything through his eyes - opened wide as he saw the ocean. He just stared at it for several minutes. He was hypnotized by the gentle movement of the water. Baby E was beyond excited to finally be at the beach, she's been talking about it all the time. At home she likes to play 'pretend beach' on the bed or rug, pretending to be laying in the sand getting a tan. The water was freezing. Even that didn't stop her from getting her feet wet! My mom comes over twice a week and takes the kids outside for a couple of hours so I can get some dedicated work time. So thankful to have that, it keeps me sane. Through the summer though, just as we did last year, at least one of the days she is here I spend with her and the kids because life is too short to work non-stop. 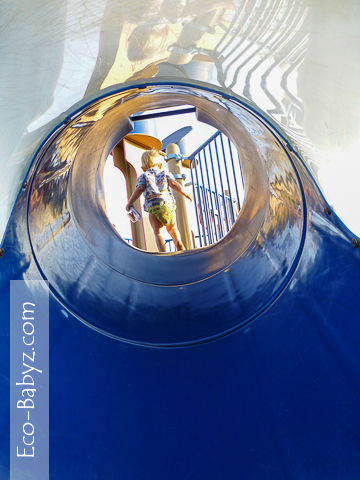 We usually pick a destination within a half hour drive of our house and enjoy the summer weather and spending time with the children. This always gets me really behind on work, but you know what? I don't really care, I need some downtime too - in the winter I really don't get much, if any. So we were really enjoying it, watching the kids dig in the sand. Thankfully Baby T didn't try to taste it, but he did rub his eyes with a sandy hand and that was no fun! Okay, so we can handle that, no big deal. 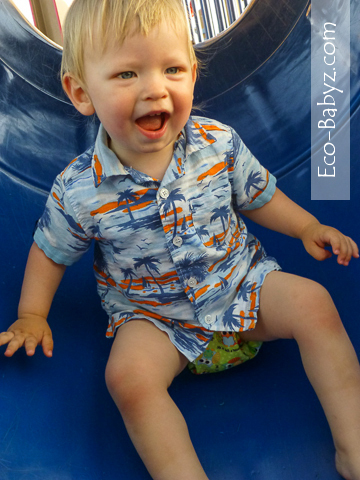 In two second flat he ran right into the water with zero fear and squealing with delight! Now that would be the perfect moment to capture if it wasn't for one thing - he didn't even think of stopping. In absolutely frigid waters all he wanted was to run right into the ocean! This kid is something! His stubborn nature shined through when for about ten minutes straight he would just try to pull himself, along with me, right into the ocean - until I was completely exhausted from trying to keep him from going under. So that's that, we just had to leave, otherwise he would have loved to dive right in! This little kid knows no fear. Baby T running into the ocean, not wanting to stop! Baby E's and T's first day at the beach was a success, though it really exhausted me and made me long for a nap! 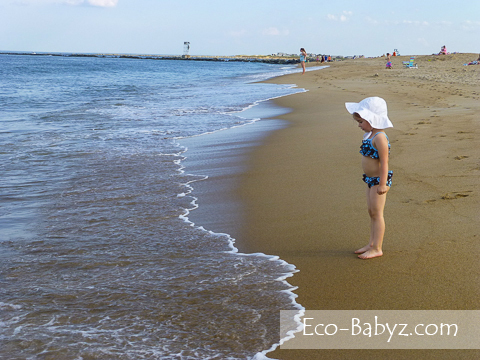 Do you like going to the beach with your babies/toddlers? Do you have any crazy stories to share? That's great, sounds like fun! amazing photos!!! i also have yet to take my extremely rambunctious 3 and 4 year old to the beach this summer we live in florida and i am 6 months pregnant thier daddy works most days so beachdays are uncommon as a family we usually go to the pool with friends its hard to go to the beach around here too many college kids :/ i just dont feel like its safe by myself with the kiddos. Thank you Sasha! Yeah, that sounds like it would be tough! Although my 4.5 year old is entirely on her own - I keep an eye on her, but she doesn't need me right there next to her and she never goes into the water too deep. The 3 year old though may not have such a good sense of danger! We love to go the the lake beach up in Michigan at a small lake. For the first couple of years, our son didn't like the water much, but this year, he really got into it. I bet if I brought our little daughter to the beach right now, she would be trying to eat the sand. She wasn't crawling yet in July, but she is really getting around now, although not exactly crawling, so I'm not sure what we will do if we go to the beach again soon here in Kentucky. Lovely pictures! My son loves the beach -especially the sand!! He too, loves the water, and tried to get away from me while we were IN it - he can't swim yet! Funny guy. 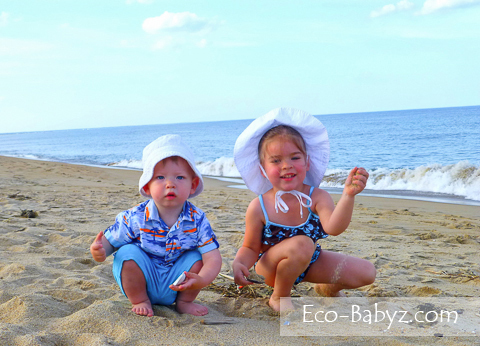 We love watching the kids at the edge of the surf. The sense of wonder is something you only really get to see when they are that small, it brings the same wonder of the world to us as well. It IS so fun to watch them and how easily amused they are, makes me want to be a child again! i live on cape cod so lots of nice beaches and impossible to resist. 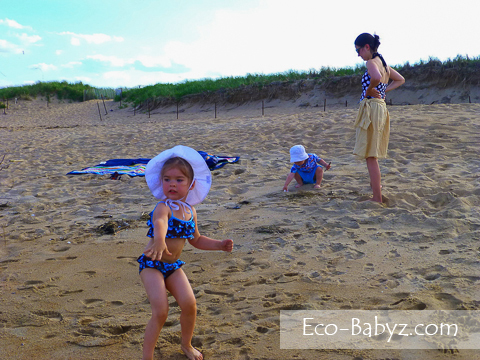 the beach was so hard managing a baby and a toddler and a 7 year old who wanted to swim the whole time! 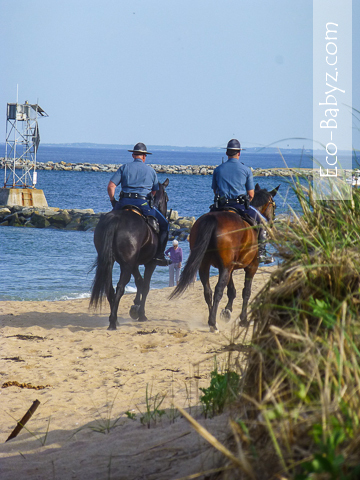 its very interesting that they have police on horses that patrol the beaches i have never seen that happen here. I just had to read through this and enjoy the pictures since it's sub zero here and I can't wait for some warmer weather! We have a pool so sadly I've never even taken my 2 1/2 year old son to the beach. I'm going to this summer, there are some nice ones fairly close to us and he would just love it- even more than he loves his sand box. I also have a 7 month old daughter so it'll be an interesting trip when we finally get to go!